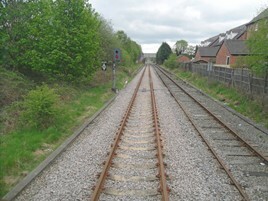 A strategic outline business case to reopen the freight-only line through Middlewich in Cheshire to passenger traffic (RAIL 814) has been formally requested by government. The strategic outline business case is currently being developed by Cheshire East Council in conjunction with Cheshire West and Chester Council and the Cheshire and Warrington Local Enterprise Partnership. It will consider demand, cost estimates and value for money on proposals to open new stations at Middlewich and Gadbrook Park on the 81/2-mile line, which closed to regular passenger traffic in 1960. The request (made by Secretary of State for Transport Chris Grayling) to study the viability of these plans in more detail was confirmed in the House of Commons on July 5, during a question posed by local MP Fiona Bruce (Conservative, Congleton). Grayling replied: “There are two routes in the North that I feel particularly keen to look at seriously reopening. One is the line from Skipton to Colne, the other is the line that passes through Middlewich that, in my view, should be a commuter railway into Manchester.